Globalisation is the context of economic and academic trends that are part of the 21st century reality. Internationalisation of education is the process of integrating an international, inter-cultural and/or global dimension in the goals, functions (teaching/learning, research, services) and delivery of higher education. Internationalization includes the policies and practices undertaken by academic systems and institutions—and even individuals—to cope with the global academic environment. The motivation for internationalization includes commercial advantage, knowledge and language acquisition, enhancing the curriculum with international content, and many others. Sam Higginbottom University of Agriculture, Technology and Sciences has inculcated an educational vision, able to provide the global society with education that meets current needs and that can respond efficiently to contemporary demands and challenges, which are characterized by globalisation, interdependence, and multiculturalism. Specific initiatives such as, cross-border collaborative arrangements, programs for international students, and others have been put into place as part of internationalization. The total strength of international students pursuing various diploma, degree and doctoral programmes at SHUATS has increased to over 650 from a few students in the past few years. To further strengthen globalization and internationalization of the University, SHUATS has collaborated with numerous international institutions and organisations. The main objectives of these collaborations encompass the exchange of scientific knowledge, long term staff and student exchange, holding of joint academic events such as seminars / workshops and conferences, etc. The vision of the Directorate of International Education and Training is to foster an academic, social and cultural environment to serve the needs of Sam Higginbottom University of Agriculture, Technology and Sciences' international community and promote internationalization to create a better intellectual environment for optimal human resource development. It will work towards the materialization and realization of the aspirations of SHUATS in terms of its contribution and advancement in technology and sciences with a global perspective. The Directorate of International Education and Training strives to make SHUATS a prominent contributor in international education and research by training and educating international students. Its mission is to exchange scientific and technical knowledge on the international platform in order to contribute towards the various fields of education and research globally; to ensure the inculcation and development of international competencies amongst the faculty and students of SHUATS; to provide information, advice and assistance on a variety of issues affecting students and staff going abroad for training, seminars, projects, improvement programmes, etc. to liaison with the various faculties and departments of the university and provide assistance and information on matters pertaining to international students at SHUATS. Er. C. J. Wesley, Deputy Registrar (CRP) represented SHUATS in the Educational Fair organized by the EdCIL (India) Ltd., MHRD, Govt. of India under the Study in India campaign at Colombo, Sri Lanka on 15th and 16th October 2016. Dr. Samuel Richmond Saxena, Assistant Professor, Faculty of Theology to participated in the South Asia Regional Creation Care Conference held at Hotel Bhrikuti, Godavari, Lalitpur, Nepal from 12th – 16th September, 2016. Er. Anuj Peter, Deputy Registrar (Academics) attended the international seminar on Management of Higher Education Institutes organized by Galilee International Management Institute, Israel from 14th – 25th July, 2016. Prof. (Dr.) Mrs. Ranu Prasad, Professor & Dean, ECCS and Mrs. Victoria Amit Masih, Jt. Registrar (LAE) attended the international seminar on Human Resource Management organized by Galilee International Management Institute, Israel from 23rd June – 4th July, 2016. Dr. Virginia Paul, Associate Professor, Ethlind School of Home Science, Faculty of Agriculture, visited the Queens Medical Research Institute, Scotland, United Kingdom from 10th June, 2016 to 25th June, 2016 as Project Coordinator (India) for the joint project titled – “Household Food Insecurity, Food Practices and Health Risk among Indian Women” approved by the Department of Science and Technology and United Kingdom – India Education Research Initiatives (DST-UKIERI). Prof. Dr. Ajit Paul, Head, Department of Mathematics and Statistics visited the Queens Medical Research Institute, Scotland, United Kingdom from 10th June, 2016 to 25th June, 2016 as Executive Member and Statistician for the joint project titled – “Household Food Insecurity, Food Practices and Health Risk among Indian Women” approved by the Department of Science and Technology and United Kingdom – India Education Research Initiatives (DST-UKIERI). Prof. Dr. Amita Verma, Head, Department of Pharmaceutical Science presented her paper titled 'Novel Pyrazole-benzotrizole prevents pneumococcal sepsis in vivo by potentiating cell survival via inhibition of pneumococcal cell wall degrading virulence factor' in the 10th International Symposium on Pneumococci and Pneumococcal Diseases (ISPPD), held from 26th June – 30th June, 2016 at Glasgow, UK. Dr. Vikas Kumar, Assistant Professor, Department of Pharmaceutical Sciences presented his paper titled 'Efficacy of variable dose of α-Mangostin nanoformulation in immunocompetent rat model of Pneumococcal Pneumonia' in the 10th International Symposium on Pneumococci and Pneumococcal Diseases (ISPPD), held from 26th June – 30th June, 2016 at Glasgow, UK. Dr. Samuel Richmond Saxena, Assistant Professor at the Gospel and Plough School of Theology participated in the Global Proclamation Congress for Pastoral Trainers held in Bangkok, Thailand from 15th – 22nd June, 2016. Dr. Ms. Alamara, Assistant Professor, Department of Anthropology presented a paper in the Universal Academic Cluster International Summer Conference held in Bangkok, Thailand from 2nd – 3rd June, 2016. Prof. Dr. Jahanara, Professor & Head, Department of Anthropology participated in the Universal Academic Cluster International Summer Conference, held in Bangkok, Thailand on 2nd & 3rd June, 2016. Dr. Stephen Das, Director (International Education), DIET and Financial Consultant, JSBS represented SHUATS in the International Education Fair organized by EdCIL in Kathmandu, Nepal from 20th to 23rd May 2016. Prof. Dr. S. B. Lal, Pro Vice Chancellor (Administration) and Prof. Dr. Gautam Ghosh, Dean, Naini Institute of Agricultural Sciences participated in the Aggies UAE Alumni Meet – 2016 held at India Club, Dubai on 22nd April, 2016. Prof. Dr. M. Imtiyaz, Chairman, Directorate of International Education and Training visited the Asian Institute of Technology from 22nd to 28th March, 2016 to meet Prof. Nitin Tripathi, Director, Special Degree Programs; Prof. Voratas Kachitvichyanukul, Dean, School of Engineering and Technology; Professor Rajendra P. Shrestha, Dean, School of Environment, Resources and Development and Dr. Peeyush Soni, Associate Professor, SERD regarding collaborative teaching, research and extension programmes between AIT and SHUATS. Dr. Stephen Das, Director, DIET attended the EdCIL India Education Fair organised by EdCIL in collaboration with Indian High Commission / Embassies in Nairobi - Kenya, Kigali – Rwanda, and Dar-Es-Salaam - Tanzania from 11th February 2016 till 21st February 2016 for promotion of SHUATS in the abovementioned countries. Dr. Hira Bose, Assistant Professor, Department of English and Foreign Languages, presented her paper titled 'Influence of inherited Bengali culture in the life of the Protagonist in Bharati Mukherjee's Novel – Desireable Daughters' in the 4th International Congress of Bengal Studies scheduled to be held on 12th -13th December, 2015 at Tokyo University of Foreign Studies, Tokya, Japan. Dr. Dipak Kumar Bose, Associate Professor, Department of Agricultural Extension and Communication presented his paper titled 'Impact of self help groups on the empowerment of women in Cooch Behar District of West Bengal' in the 4th International Congress of Bengal Studies held on 12th -13th December, 2015 at Tokyo University of Foreign Studies, Tokya, Japan. Prof. Dr. Rajendra Kumar Issac, Department of Soil, Water, Land Engineering and Management, Vaugh Institute of Agricultural Engineering and Technology participated and delivered Keynote Address at the Second Vinogradov's Conference – “Art of Hydrology”, 2015 scheduled to be held from 18th November, 2015 to 21st November, 2015 at St. Petersburg State University, St. Petersburg, Russia. Dr. Vikas Kumar, Assistant Professor, Department of Pharmaceutical Sciences, Faculty of Health Sciences, participated in the European Society for Medical Oncology (ESMO) Asia 2015 Congress scheduled to be held from 18th December, 2015 to 21st December, 2015 at Singapore. Prof. Dr. S. B. Lal, Pro Vice Chancellor (Administration) and Prof. Dr. Arvind Dayal, Dean, Faculty of Health Sciences participated in the international conference – 'Christian Responses to Global Health Issues' organized by Biola University at Universitas Pelita Harapan (UPH), Jakarta, Indonesia from 2nd to 4th December, 2015 and thereafter visited the Asian Institute of Technology, Bangkok, Thailand to explore the possibilities of cooperation in education and research between SHUATS and AIT, Bangkok. Dr. Amita Verma, Professor and Head, Department of Pharmaceutical Sciences, Faculty of Health Science, presented research paper titled “Design and Discovery of Potent Hybrid 1,3,5 – Triazine-1,3- Thiazine Analogs Clubbed via Amine Bridge: A Novel For Next Generation NNRTI” at the 15th European AIDS Conference 2015 held in Barcelona, Spain from 21st to 24th October, 2015. Prof. Dr. Newman Fernandes, Dean, Faculty of Management attended the 26th Conference of the International Council for Distance Education held in Sun City, South Africa from 14th – 16th October, 2015. Prof. Dr. Chandra Kant Shukla, Additional Director, Development attended the 26th Conference of the International Council for Distance Education held in Sun City, South Africa from 14th – 16th October, 2015. Dr. Ankit Singla, Assistant Professor, Jacob Institute of Biotechnology and Bioengineering, Sam Higginbottom University of Agriculture, Technology & Sciences attended the PAWEES Award Ceremony organised by the International Society of Paddy and Environment Engineering held from 18th - 21st August, 2015 at the University Putra Malaysia in order to receive PAWEES Paper Award (SAWADA Prize) for the year 2015. Rev. Dr. Samuel Richmond, Associate Chaplain, attended the Faraday Institute Summer Course held from 5th July, 2015 to 10th July, 2015 at the Faraday Institute of Science and Religion, St. Edmond's College, Cambridge. Dr. Udaya Pratap Singh, Assistant Professor, Department of Pharmaceutical Sciences, Faculty of Health Sciences to presented paper as Innovative Researcher in the 3rd International Conference on Prevention and Infection Control, WHO held from 16th – 19th June, 2015 in Geneva Switzerland. Dr. Shailesh Marker, Director Research participated in the Elsevier APAC Research Intelligence Conference cohosted with Fudan University in Shanghai, China held from June 11-12, 2015 at Ramada Wujiaochang Shanghai. Prof. Dr. A. K. Gupta, Head, Department of Forensic Science, Sam Higginbottom University of Agriculture, Technology & Sciences participated in the 4th International Conference organized by the Indian Council of Chemists which held at Tashkent, Uzbekistan from 13th to 15th June, 2015. Dr. Amit Chatree, Head, Department of Chemistry, Faculty of Science visited Tashkent, Uzbekistan for paper presentation in the '4th International Conference on Applications and Management in Chemical Sciences', held from 13th -15th June, 2015. Prof. Robin L. Prasad, Registrar and Dr. Stephen Das, Director, DIET attended the 5th QS – MAPLE Conference held at Doha, Qatar from 5th – 7th May, 2015. Prof. Dr. Nitin Tripathi, Director, Special Degree Programmes and Prof. Dr. G. Louis Hornyak, Director, Center of Excellence in Nanotechnology, Asian Institute of Technology, Bangkok, Thailand visited SHUATS on 23rd & 24th October, 2016 to discuss the possibilities for signing a Memorandum of Agreement between the Center of Excellence in Nanotechnology, AIT and Jacob Institute of Biotechnology and Bioengineering, SHUATS for collaboration in academics, research, training, staff/student exchange, etc. Prof. Hornyak will gave a lecture on Nano - Biosciences for the faculty and students on 24th October, 2016 at the University Auditorium, JSBB. Dr. Joseph Shevel, President, Galilee International Management Institute, Israel visited SHUATS from 18th – 20th September, 2016 as a Guest of Honour during the 11th Convocation Ceremony of SHUATS. Dr. Shevel presented a seminar on 'Development Based on Capacity Building and Education – The Israeli Example' on 19th Sept, 2016 at 2:30 pm. Mr. Amanullah Faqiri, Director (Finance), Ministry of Agriculture, Govt. of Afghanistan visited SHUATS from 8th to 15th September, 2016 in order to meet the officials of the Directorate of International Education and Training and discuss the matters related to the finance of Afghan students pursuing higher education at SHUATS. Prof. Nitin Tripathi, Director, Special Degree Programmes, Asian Institute of Technology, Bangkok, Thailand visited SHUATS on 21st August, 2016 and 22nd August, 2016 to meet the university officials to discuss for memorandum of Understanding which is proposed to sign between AIT and SHUATS during the visit of our Hon'ble Vice Chancellor, Prof. Dr. Rajendra B. Lal to AIT. Mr. Amanullah Faqiri, Director (Finance), Ministry of Agriculture, Govt. of Afghanistan visited SHUATS from 10th to 14th July, 2016 to meet the officials of the Directorate of International Education and Training and discuss the matters related to the finance of Afghan students pursuing higher education at SHUATS. A high level delegation from the Tertiary Education Trust Fund (TET), Federal Govt. of Nigeria consisting of Mr. Umar Abdullahi Mari, Deputy Director (AST&D), Mrs. Geraldine Maria Adewole, Principal Executive Officer and Mr. Kabiru Mohammed Sarki, Senior Accountant visited SHUATS on 4th May, 2016 to meet the officials of the University and check the performances of the students sponsored by TET to pursue higher education at SHUATS. Prof. Abdul Rashid Hakimi, Hon'ble Vice Chancellor (Relation Coordination), Afghan National Agricultural Sciences and Technology University, Kandhar, Afghanistan visited SHUATS from 30th April – 1st May, 2016 to discuss the implementation of the memorandum of understanding signed between ANASTU and SHUATS and meet the higher officials of the university. Dr. Edwin Higginbottom, grandson of Dr. Sam Higginbottom, founder of Allahabad Agricultural Institute is visited SHUATS from 28th January, 2016 to 4th March, 2016. Apart from teaching in the Gospel and Plough School of Theology, he has been visiting various departments and Directorates to form liaison between institutions in US and SHUATS. Mr. Tayab Nayabullah, General Manager (Finance), Ministry of Agriculture, Govt. of Afghanistan visited SHUATS on 2nd Dec, 2015 to meet the officials of the Directorate of International Education and Training and discuss the matters related to the finance of Afghan students pursuing higher education at SHUATS. A high profile delegation from Nigeria led by Dr. Bakari Ado Hussaini, S. A. Education, Deputy Governor's Office, Kano visited SHUATS on 23rd November, 2015 to meet the university officials and the review the performance of Nigerian students at SHUATS sponsored by the Govt. of Kano State, Nigeria. Mr. Sediqullah Sahar, Education Attaché, Embassy of Islamic Republic of, Afghanistan visited SHUATS from 19th – 21st November, 2015 to meet the Hon'ble Vice Chancellor and other higher officials of SHUATS and explore further possibilities of cooperation. He also met all the Afghan students of SHUATS to assess their performance. Dr. Samuel Donkor, Hon'ble President, All Nations University College, Ghana visited SHUATS from 1st November, 2015 to 14th November, 2015 along with three other officials of ANUC to explore the possibilities of cooperation in education and research between SHUATS and ANUC, Ghana. Mr. Amanullah Faqiri, Director (Finance), Ministry of Agriculture, Govt. of Afghanistan visited SHUATS on 28th September, 2015 to meet the officials of the Directorate of International Education and Training and discuss the matters related to the finance of Afghan students pursuing higher education at SHUATS. Prof. Roshaan Wolusmal, Hon'ble Vice Chancellor of Afghan National Agricultural Sciences and Technology University, Kandhar, Afghanistan visited SHUATS from 13th August, 2015 to 15th August, 2015 for signing a Memorandum of Understanding between SHUATS and ANASTU and as Chief Guest for the 69th Republic Day Celebration Ceremony on 15th August, 2015. Mr. Hejratullah Zia, Training Coordinator, Afghanistan Agricultural Inputs Project (AAIP), Ministry of Agriculture, Irrigation and Livestock (MAIL), Afghanistan visited SHUATS from 18th May to 29th May, 2015 to review the performance of the 37 Afghan students sponsored by AAIP and discuss the scope of training and educating Afghan students at SHUATS with the officials of the Directorate of International Education and training. Er. Vaibhav Willson Masih, Teaching Associate at the Department of Civil Engineering has been sponsored by the University under the Faculty Improvement Programme in 2016 for M. Eng. Civil Engineering (Structural Engineering) at Asian Institute of Technology, Bangkok, Thailand. Er. Ankit Keneth Lall, Teaching Assistant at the Department of Civil Engineering has been sponsored by the University under the Faculty Improvement Programme in 2016 for M. Eng. Civil Engineering (Geotechnical Engineering) at Asian Institute of Technology, Bangkok, Thailand. Prof. Dr. D. M. Denis, Department of Soil, Water, Land Engineering and Management was sponsored by the University in August, 2011 for Masters Programme in Remote Sensing and GIS at International Institute for GeoInformation Science and Earth Observation (ITC), Netherland. Er. Aditya Lal, Assistant Professor, Dept. of Food Process Engineering was sponsored by the University under the Faculty Improvement Programme in 2011 for Ph. D. in Food Engineering and Bioprocess Technology at the Asian Institute of Technology, Bangkok, Thailand. Er. Anjelo Denis, Junior Lecturer, Dept. of Soil, Water and Land Engineering and Management, was sponsored by the University under the Faculty Improvement Programme for M. Tech in Water Engineering and Management programme in 2010at the Asian Institute of Technology, Bangkok, Thailand. Mr. Stephen Das, Financial Consultant, Joseph School of Business studies was sponsored by the University under the Faculty Improvement Programme in 2010 for Dual Degree in MBA Finance and CFA at the London School of Business and Finance, UK. Er. 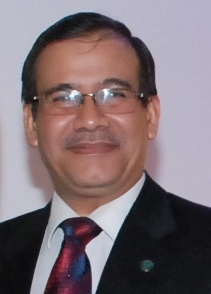 Rahat Khan, Head & Associate Dean, School of Film & Mass Communication was sponsored by the University under the Faculty Improvement Programme in 2009 for M.Sc. Programme in the field of Media Technology at University of Bradford, UK. The Directorate of International Education and Training advices and assists the students who have the aspirations to study abroad and obtain an international exposure. Every year, Prof. Dr. M. Imtiyaz, Chairman, DIET nominates students on the basis of merit for scholarships/ fellowships to pursue higher education at the Asian Institute of Technology, Bangkok, Thailand. Many students were awarded scholarships / fellowships including H.M. King's Scholarship and AIT Fellowship. Due to the continuous efforts of the Directorate, the total strength of international students who have successful completed various degree , diploma and doctoral programmes is over 600 and the number of international students pursuing various programmes at SHUATS has increased to over 650 currently. Presently SHUATS has students from Afghanistan, Bhutan, Brazil, Burundi, Ghana, Iraq, Japan, Kenya, Libya, Myanmar, Nepal, Nigeria, Pakistan, Palestine, South Korea and Yemen.